The polar vortex has us cooped up in the house. It’s -25 (yes negative!) right now – which has been a great excuse to stay indoors, try new recipes and organize a few things at home. 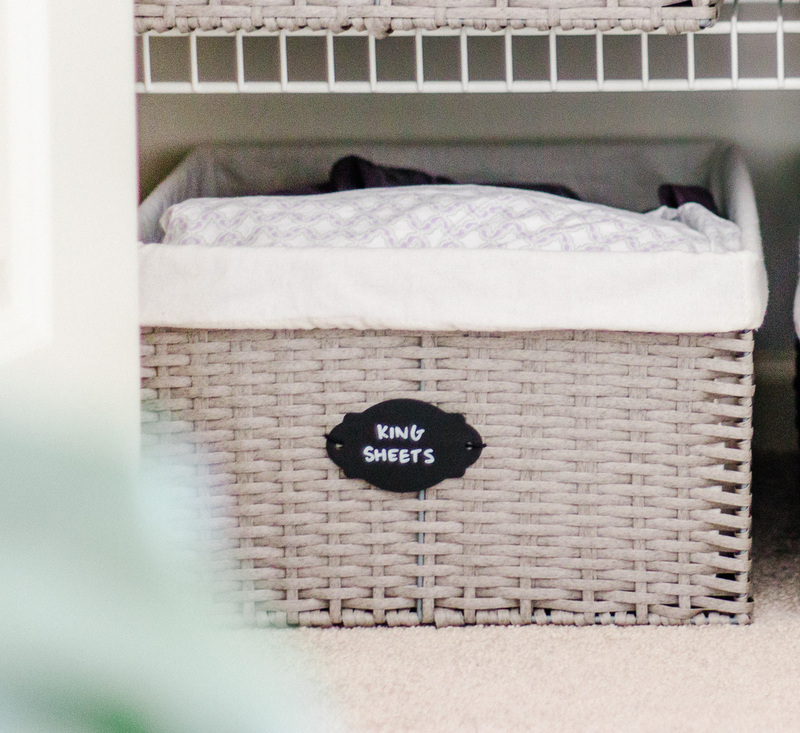 Our linen closet is actually one place that hasn’t needed a refresh in almost a year. I took a few easy steps to organize it and a year later, it looks almost exactly the same. The fact that it has stayed organized, and I don’t mind when the door is left open, makes me so happy! I didn’t do anything over the top or fancy. I have wanted to switch out shelves and add fun wallpaper to make it amazing. For now, all that really matters is that it is CLEAN, ORGANIZED and works for our family. Also, it didn’t cost very much to get here. 1. Take everything OUT of your closet and group each item by category. Making piles in an open space helps to see quantity of each item. The next couple steps will be about decluttering these piles and choosing the right piece to store them in. So don’t skip this step! 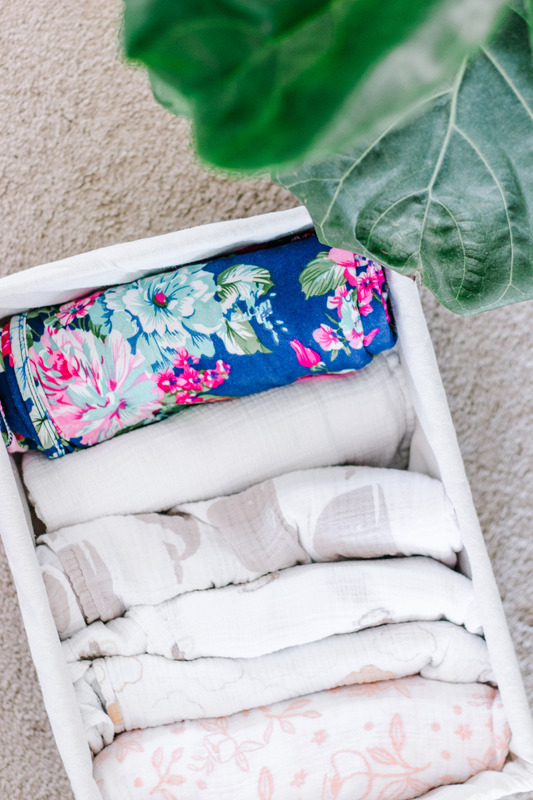 Look at each category and think about which items you actually want to keep in your linen closet. Discard anything not used. Throw out old makeup, travel items that you’ll never use, donate towels you don’t love, etc. Relocate items that don’t belong. We moved beach towels and a few other things that didn’t NEED to be in our linen closet. Display items you use often. Are there items you use often and wouldn’t mind being on display? We had soaps and cotton balls in our linen closet and opted to keep them in our master bath stored nicely in glass vases. We use towels often so we keep some in the linen closet and have some rolled up in our master bath too. Don’t forget to take a look at what is in your bathrooms too and see if it makes more sense for those to be in the linen closet (ex: we moved our contacts and nail polish into the linen closet). 3. 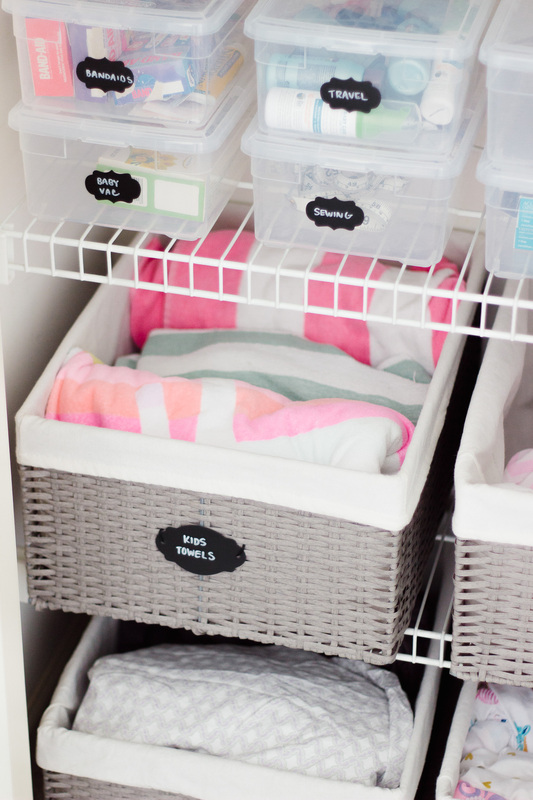 Organize with boxes and baskets. You’ll notice I ONLY USED 1 type of basket and 1 type of box. 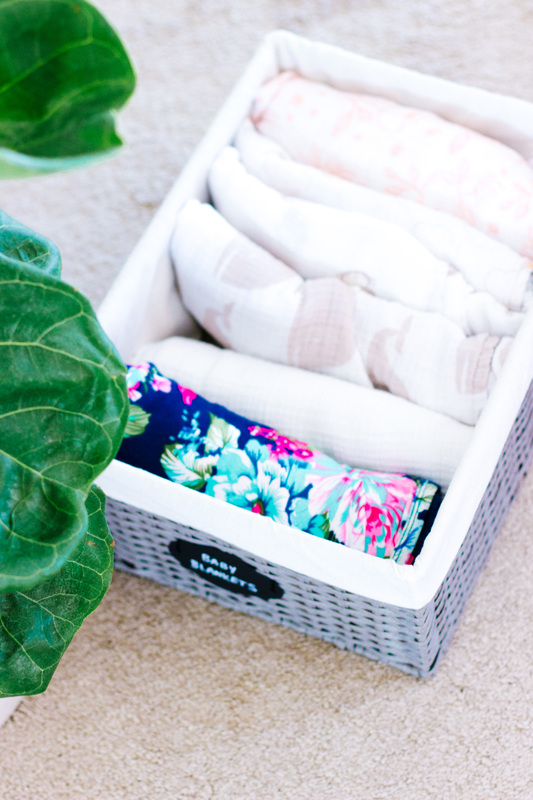 These clear shoe boxes are great for smaller items and these larger Monatauk baskets for perfect for larger categories. Take a look at your piles and store each category in an appropriate size box or basket. I’ll break down our categories below so you can see how we organized everything. This is going to be different for everyone but it may give you ideas. Ours is very baby and kid focused right now but these overall steps work with any person or family. The shoe boxes are sold individually or in sets of 20 (I recommend buying the set of 20). We use these shoe boxes all around our house for items from art supplies, toys to shoes. I think we have at least 60 in our house. For the small clear boxes, this a must. I like these chalkboard sticker labels. This could be optional for the larger baskets. I like labels on the baskets in case someone else is grabbing something from the linen closet, or putting something away. We used these labels for the larger boxes which tie on. Writing with chalk pens are much easier than with real chalk. 5. Fold (or roll) and put away. Rolling our sheets and the baby blankets work for us. Being able to SEE them easily is key. I like our towels folded but some prefer to roll theirs to for storage. Play around with both methods and see which you like better. The baskets for our sheets are at the bottom of the closet because we don’t need to access these on a daily basis. The clear bins that we use often are at eye level and the less used items are stored in boxes stacked up high. As promised, here’s a list of categories that we used. Yours may look different but hope this is helpful to get started! The majority of our closet is taken up by baby and kid things which isn’t the case for everyone. Our sheets, towels, toiletries and more are ORGANIZED. Which really makes me happy (and everyday life just a bit easier). We just switched up the girls rooms during this polar vortex too! You can see how we changed Harper’s nursery here on Instagram. We love it even more now! Can’t wait to share the big sisters room refresh! Thanks Steph! It’s seriously the best to have at least ONE space organized in our house ;)! So organized! Wonderful job Samantha. 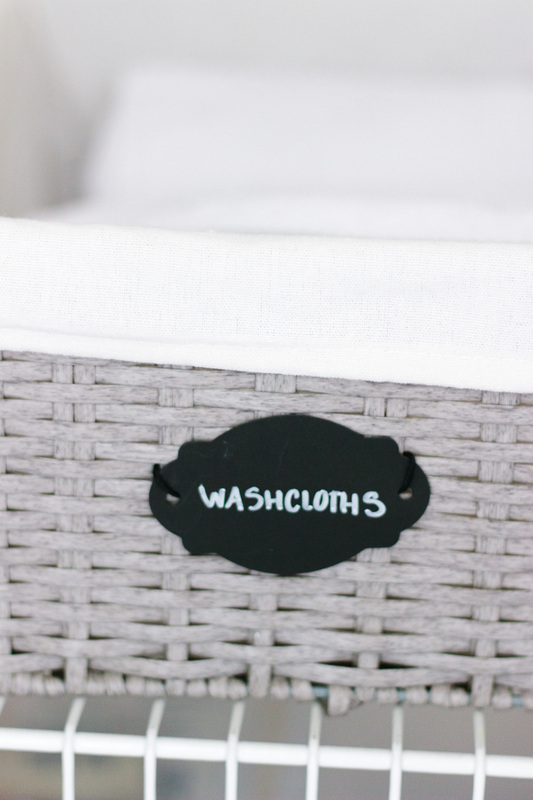 Which size baskets did you use? I used both the medium size and the large size. I was able to fit 3 medium sized boxes across on one shelf, for the items I grab often (washcloths, baby blankets) and the smaller category (pillow cases). The bottom 2 shelves are the large size. They hold a lot!